We have two ministry trips planned this month so I have been trying to get our house fixed up before I leave. So far I’ve fixed three roof leaks, a wall installed, and some plumbing problems are almost fixed. It is amazing how each job seems to come with a set of hidden prerequisites. You want to put a shower head on, but discover that the valve has rusted, then discover that the wall is rotten… The 5 minute job ends up taking a lot more than 5 minutes. 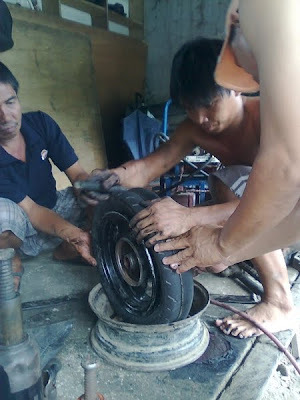 An example of this came last week when a Filipino friend called to say he had a flat tire on his scooter and could I bring a pump to pump it up for him. When I found him I discovered a rather large puncture in the tire, so offered to take it down to the tire shop. Here in the Philippines there are lots of tire shops. They are little sheds along the road with a “Vulcanizing” sign out front. I found one right away and the fellow set to work. Five hours later… After a running from store to store trying to find a replacement tire and after watching a team of drunk workers trying to fix the tire by tying ropes around it and hitting the valve with a hammer until it was smashed to pieces, I left with a good tire. It was quite an experience. Next time I suspect I’ll pick a different tire shop. I'm amazed! That rope-tying, valve-smashing method seems like it would be so effective! You are indeed a very busy family!